The winter is cold and dark, but the days are lengthening. It is a Sunday in early February 2017 which promised gloom, but burst instead into a bright unforecast winter sunlight. I get on my bike and I head back to Flowton. All the way, the fields are dead, the crows in possession. Riding the hills from Nettlestead, I freewheel down into Somersham and up the other side of the valley. Now the clouds begin to gather again, but I am not downhearted, for snowdrops in the hedgerows signal the yearly cycle beginning again, spring not unheralded. The world will come back to life, and all too soon it will be May, Mary's month. Listen: the hedgerows full of birdsong, as the endless circle of life renews itself. Chaffinches spiralling and flustering in their ritual of courting and nesting; below them, a pair of warblers twisting in a perilous skein over the road surface. A pair of jays hammer the sky beyond. This is spring as it has always been, adapting itself minutely from year to year as Suffolk around it changes. A hundred years ago, these lanes were full of people, for in those days the villagers were enslaved to the land. But a farm that might support fifty workers then needs barely two now, and the countryside has emptied, villages reduced to a third of their size. To be a farmworker these days is a solitary calling, and I felt at one with them as I raced over the gentle rises on my bike. 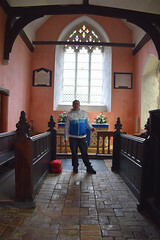 In all this journey from Bramford, apart from a brief frenzy of activity at Somersham, I had seen only one other person, and she was on horseback three miles ago. Suffolk is quieter now than at any time since before the Saxons arrived, and nature is returning to it. In the early spring of 1644, a solemn procession came this way. The body of Captain William Boggas was brought back from the Midlands, where he had been killed in some skirmish or other, possibly in connection with the seige of Newark. The cart stumbled over the ruts and mud hollows, and it is easy to imagine the watching farmworkers pausing in a solemn gesture, standing upright for a brief moment, perhaps removing a hat, as it passed them by. 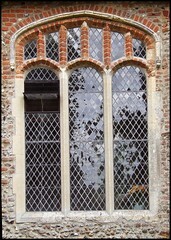 But no sign of the cross, for this was Puritan Suffolk. 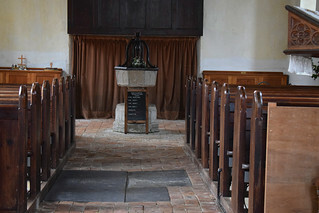 Even the Church of England had been suppressed, and the local Priest replaced by a Minister chosen by, and possibly from within, the congregation. 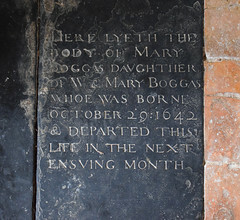 William Boggas was laid to rest in the nave of the church, beside the body of his infant daughter who had died a year earlier. 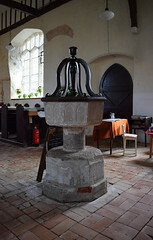 His heavily pregnant widow would have stood by on the cold brick floor, and the little church would have been full, for he was a landowner, and a Captain too. And the story doesn't end there. So, I cast my mind back to a glorious May day in 2007, with the heat of summer already more than a promise, I arrived again in Flowton. Here, the trees in the hedgerows gathered, and the early leaves sent shadows dappling across the road beneath my wheels. The antiquarian David Davy came this way in a bad mood in 1829, with his friend John Darby on their way to record the memorials and inscriptions of the church: ...we ascended a rather steep hill, on which we travelled thro' very indifferent roads to Flowton; here the kind of country I had anticipated for the whole of the present day's excursion was completely realised. A more flat, wet, unpleasant soil and country I have not often passed over, & we found some difficulty in getting along with safety & comfort. The roads have changed here since Darby and Davy came, but the church hasn't much. The Victorians were kind to Flowton; perhaps, because the Puritans had been. 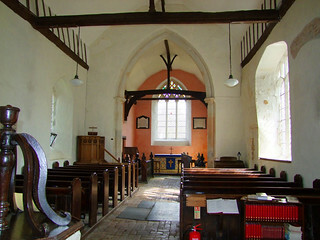 It has a delicious atmosphere, that of an archetypal English country church. The narrow green sleeve of the graveyard enfolds it, rather formal to the north, but wildly overgrown on the south side. The tower is one of those curious affairs where the upper storeys have been taken down at some time, presumably because they were unsafe. The capped base looks rugged and primitive; one might think it early, even Norman. 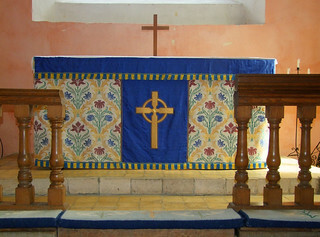 In fact, this pretty little church is almost all of a 14th century piece, in the Decorated style. 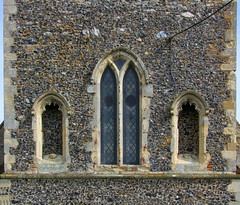 The west face of the tower still has its niches, which once contained the images of Saints who watched over the travellers passing by. Another thing curious about the tower is that it has no west door. Instead, the door is into the south side of the tower. There must be a reason for this, for it exists nowhere else in Suffolk. Perhaps there was another building to the west of the tower. 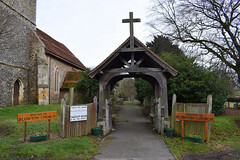 However, there are several churches in this area with towers to the south of their naves, and the entrance through a south door into the porch beneath the tower. Perhaps that was originally the intention here. 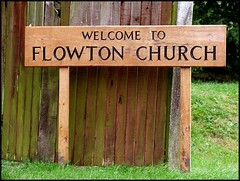 The signs by the lychgate say Welcome to Flowton Church. Now, this is easily done, but does it mean anything? Yes, it does, for this church is always open during the day. 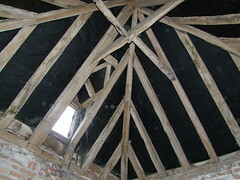 And so you step into a sweetly ancient space, a slight damp in the air from the winter now going. 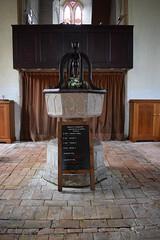 The brick floor is uneven but lovely, lending its organic quality to the font, a purbeck marble survival of the 13th Centurty which seems to grow out of it. 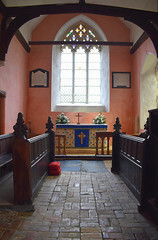 The bricks spread eastwards, past Munro Cautley's pulpit of the 1920s, and up beyond the chancel arch into the chancel itself. Glazed Minton tiles have their place; fortunately, that place is not here. 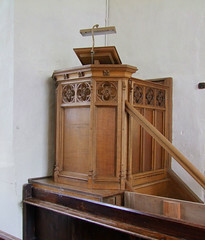 On the south side of the sanctuary there is a great rarity. 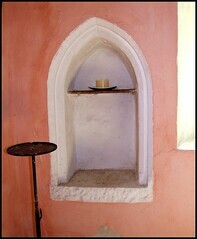 The piscina that formerly served the altar here still retains its original wooden credence shelf. 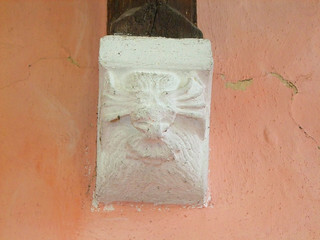 On the opposite wall is a fine corbel of a madly grinning devil. But it may be the ledger stone of Captain William Boggas that first catches your eye, a pool of dark slate in the soft sea of bricks. 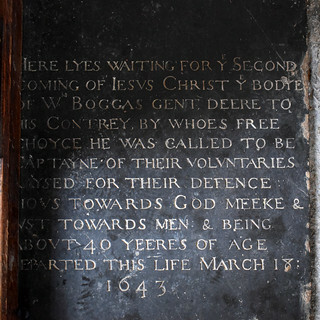 It reads Here lyes waiting for the second coming of Jesus Christ the body of William Boggas gent, deere to his Countrey, by whoes free choyce he was called to be Captayne of their vountaries raysed for their defence: pious towards God, meeke & juste towards men & being about 40 yeeres of age departed this life March 18: 1643. 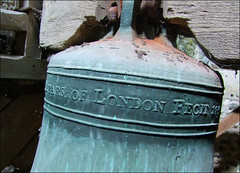 To the north of it lie two more ledgers, the easterly one to his young daughter, which in chilling legalese records the date of her birth and her death in the next ensuing month. To the west of that is one to William, his son, who was born on April 11th 1644. Now hang on, you may be thinking. How could his son have been born in April 1644 if William senior had died in March 1643? Simply, in those days the New Year was counted not from January 1st, but from March 25th; this is a quarter day usually referred to as Lady Day, in an echoing memory of the pre-Reformation Feast of the Annunciation. 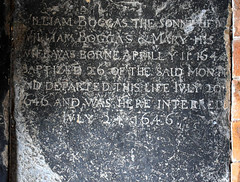 So William Boggas died one month before his son was born, not thirteen. It would be nice to think that William Junior would have led a similarly exciting and possibly even longer life than his father. But this was not to be, for he died at the age of just two years old in 1645. As he was given his father's name, we may assume that he was his father's first and only son. A further point of interest is that both Williams' stones have space ready for further names. But there are none. There would be no more children for him; how could there be? 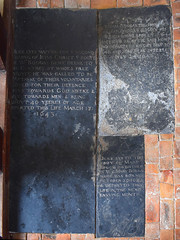 But William's wife is not buried or even remembered here. Did she move away? 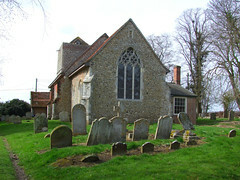 Did she marry again, and does she lie in some other similarly remote English graveyard? Actually, it is possible that she doesn't. 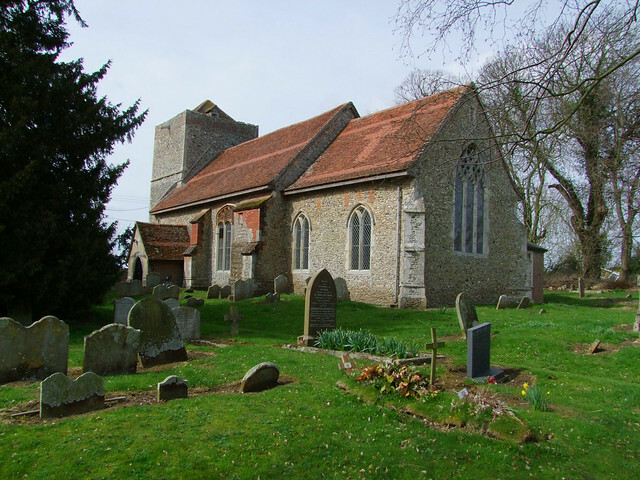 Since I first wrote this account in 2007, I've come across considerable evidence to show that Boggas's wife was Flowton girl Mary Branston, and she had been married before, to Robert Woodward of Dedham in Essex. Between the time of William Boggas's death in 1644 and the 1647 accounting of the Colony, Mary's daughter and nephews by her first marriage had been transported to the Virginia Colony in the modern United States. Is it possible that Mary went to join them? And finally, one last visitor. Four months after the birth of the younger William, when the cement on his father's ledger stone was barely dry, the Puritan iconoclast William Dowsing visited this remote place. 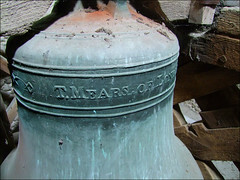 It was 22 August 1644. 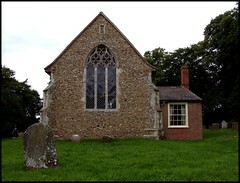 The day had been a busy one for Dowsing; Flowton was one of seven churches he visited that day. Like me, he came here after Nettlestead and Somersham. 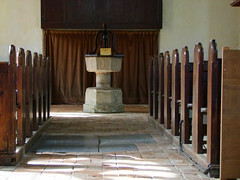 Like me, he noticed the piscina in the sanctuary. Unlike me, he ordered its destruction. This obviously didn't happen; perhaps it was filled in instead. Dowsing had arrived here in the late afternoon on what was probably a fine summer's day, since the travelling was so easy. I imagined the graveyard that day, full of dense greenery. He came on horseback, and he was not alone.With him came, as an assistant, a man called Jacob Caley. 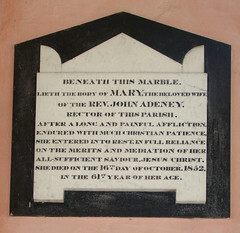 Caley, a Portman of Ipswich, was well-known to the people of Flowton. He was the government's official collector of taxes for this part of Suffolk. One thinks he must not have been a popular man. What the villagers couldn't know, of course, was that Caley was actually hiding away a goodly proportion of the money he collected. In 1662, two years after the Commonwealth ended, he was found guilty of the theft of £3000, about a million pounds in today's money. He had collected £118 of this from Flowton alone, and John Blatchly, in Trevor Cooper's new edition of the Dowsing Journals, thinks the amount he was found guilty of stealing is probably understated. On that May day in 2007 I stepped out into the calm of the graveyard, through clusters of yellow cowslips that were scattered here and there across the tussocky ground. In this place of the dead, I breathed deeply the smell of new life. A cluster of sparrows suddenly erupted from the undergrowth, boiling high above me in busy chatter, and on this bright day I thought this as lovely a place as any I have ever been in Suffolk.